Storage Bedside tables with a sleek, minimal design to match our japanese beds of the same series. These functional bedside tables are equipped with a spacious storage drawer where to keep things that you wish to have always at hand. The Yenn Japanese style bedside table is made with solid lamellar beechwood. The dimensions of the top are 40x30 cm. It can be provided with a drawer that slides out wood on wood or rolls on wheels that rest directly on the floor. Cubo bedside table is made up of solid lamellar beechwood 9mm thick; standard sizes are 35x35x35cm or 40x40x40cm. It can be provided with a shelf,a drawer with a shelf or two drawers. This bedside table can match a lot of our beds. Yenn small bench is made with solid laminated beech wood, the dimensions of the standard top are 60x40. 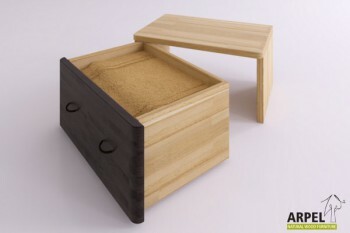 It can be provided with a drawer that slides out wood on wood or rolls on wheels that rest directly on the floor.